You know you can buy skinny green zucchini and yellow squash almost all year long at the grocery store, so what’s special about getting local, New Mexico-grown squash onto your plate this summer? 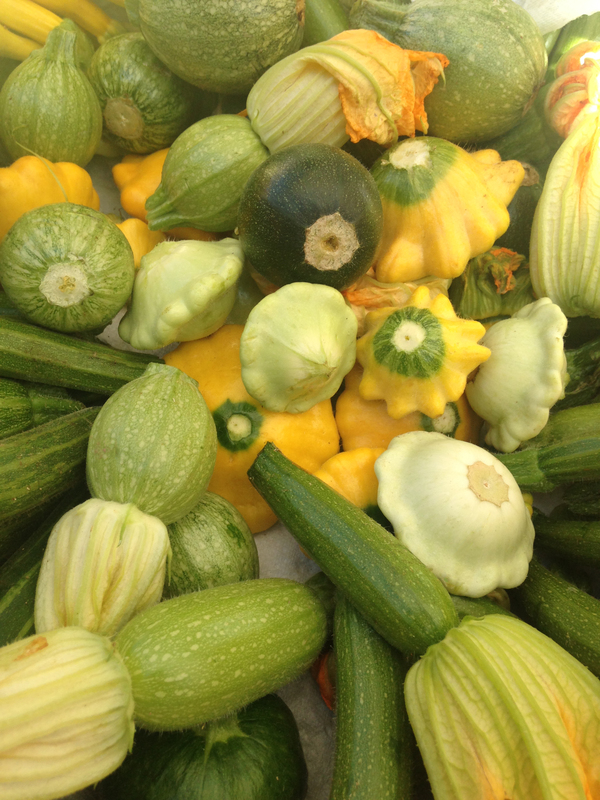 Squash comes in a huge variety, from zucchini to pattypan. Fresh from the growers’ market, it’s a welcome addition to the summer plate. 1. VARIETY: This time of year it’s not just one variety of squash that you can layer into your burrito or vegetable lasagna, but rather you will find a wide selection of varieties at local growers’ markets. Here are just a few to look for. 2. TASTE: Nothing comes close to the freshness you get from locally grown food. And that means you can spend less time preparing the food – simple is usually best. 3. VALUE: If you’re a bargain shopper, or have ever wondered if you can afford to shop at local growers’ markets, shopping for items in-season AND abundant is the key to affordability. And as anyone who has a garden or farm can tell you, squash is prolific. That means, better prices on this tasty item. 4. VERSATILITY: This is a vegetable that expresses itself well in a wide range of dishes. Nearly every cuisine in the world knows how to show it off – and its mellow, easy-going flavor makes it easy to experiment with all summer long. 5. HEALTH: Squash is an excellent low-calorie food, with only 19 calories per cup of raw squash. It is also high in fiber content and an outstanding source of manganese and vitamin C. And, studies have shown that foods that are eaten freshly picked have higher concentrations of vitamin C.
When you’re at your local growers’ market, take a stroll to see what different options you have in terms of varieties and price. Look for squash that are neither the smallest nor the largest. The skin should be tight and shiny – not waxed shiny – and it should be firm to the gentle squeeze. When you get home, store in the crisper drawer of your refrigerator. Once picked it prefers to be cool until you’re ready to use it. If the summer squash has large seeds, remove them. Smaller summer squash will have seeds so tiny you can hardly see them, but as they grow, the seeds also grow, lending bitterness and an unfortunate texture to your recipes. In this case, scrape them out, as you would with winter squash, before continuing with your recipe. 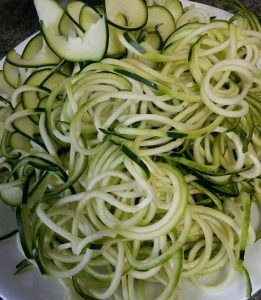 If you are eating zucchini raw, you will want to remove some of the excess water. You can do this either by squeezing it in a dishtowel or by seasoning it lightly with salt and draining it slightly before tossing it with the other ingredients to avoid adding excess liquid to your dish. If you’re grating squash to add into a sauce or baked good, it melts down quite easily. Consider adding grated squash into pasta sauce or stir it into cooked rice to make it creamy like risotto. If you are accustomed to cooking summer squash, serving it raw is a lovely change of pace. Sliced into thin ribbons, squashes like zucchini, yellow and zephyr squash have a light, satisfying crunch and refreshing flavor. And don’t forget about squash blossoms with their lovely petals. They are versatile and tasty! Try adding them, coarsely chopped, to your quesadillas, soups, and salads. When making pizza, layer the top with squash blossoms for a new and delicious pizza flavor. Just remember that no matter what variety of squash you choose to bring home from your local growers’ market, your lunch or dinner table is sure to be enhanced by this affordable, delicious and highly adaptable vegetable. For more great ideas of how what to do with squash this season (including grilling, dehydrating, and baking), head here and here. 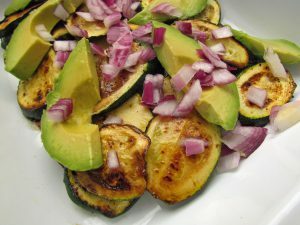 Easy Zucchini and Avocado Salad is such a simple recipe that it will become a regular addition to your summer kitchen. You can have this on the table in 15 minutes. Trim the ends off the squash and, using a mandoline, vegetable peeler or knife, cut the squash lengthwise into very thin strips. Place in a large bowl with the sliced shallot, olive oil and vinegar, and gently toss to combine. Let stand for 10 minutes. Season to taste with salt and pepper. Then add the chiffonade-style cut basil and pine nuts and gently toss to combine. Transfer to a serving dish and crumble goat cheese on top. Serve immediately.